Water under the “Everglades Skyway” – a one mile bridge over the Shark River slough. On March 19, 2013, a new chapter opened for Everglades National Park. It was a day that signaled the completion and opening of a one mile stretch of potentially free flowing water in an ecosystem otherwise bisected by the Tamiami Trail (a small section of U.S. Route 41). Since it’s inception in 1928, the Tamiami Trail has been a literal dividing line in the Everglades. In it’s day, the original Tamiami Trail was considered an engineering feat that would bring many benefits to South Floridians. Yet it forever ended the Everglades as a frontier, and also the traditional way of life of the native Miccosukee and Seminole peoples. It marked a reversal of roles, as it were. Instead of the water defining the landscape, it would now be human made canals, levees and pump gates directing the water itself! The end result after more than eight decades has been a series of permanently flooded Water Conservation Areas (WCAs) on the north side, versus a perennially water starved Shark River slough and Everglades National Park on the south side. Historical vs current flow of the “River of Grass” – the Shark River slough. CLICK for story: Kayaking the River of Grass – a Shark River Slough Expedition. Since the ground under the Everglades is mostly porous limestone, the sub-surface water naturally flows where it can, including under the Tamiami Trail. Also, more than a dozen culverts were added under the roadbed when it was widened in the 1950’s. This made sure that some water did get through, although this has been estimated to be less than half of it’s original historical flow. Compounding this problem is the fact that just about all of the water coming south of the trail for more than 50 years has been engineered by the SFWMD. This organization is charged with difficult and sometimes contradictory tasks. Managing the water supply for South Florida means delivering enough water to residents without flooding them. It also means allocating enough water for the Everglades and releasing that water at the proper time and rate. The District didn’t always get that right, but they are getting better at it. It is because of this engineered canal, levee and pump system, that the Everglades has been said to be on “life support” for so many decades! Virgin Everglades in 1924 about to get the first road to cut through the middle of it! The Collier Arch over the Tamiami Trail. Two were originally built to mark the boundaries of Collier County along the road. In 1928 it also marked a singular point of entry onto the trail. This small (service) bridge over the nearby L-67 canal is actually on the roadbed of the original Tamiami Trail which parallels the current highway. Before 2013, this canal provided most of the “engineered” water into Shark River slough! 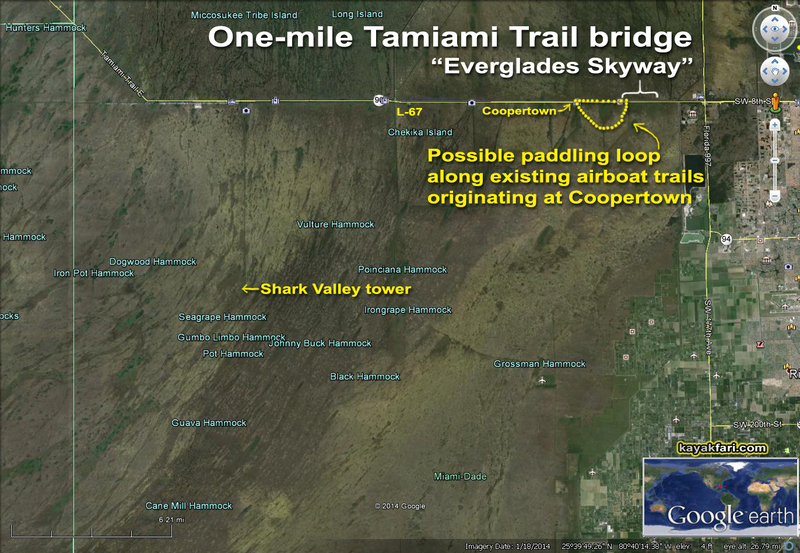 The One-mile Tamiami Trail brdige over the Shark River slough in relation the east Everglades and Shark Valley. The new one-mile Tamiami Trail bridge elevated section, sometimes called the “Everglades Skyway” is the first attempt aimed at correcting this severe imbalance. With an additional 5.5 miles of elevated roadway planned, adequate water flow to the Park can be restored – in theory, at least. These openings won’t do much by themselves unless more water is allowed to actually flow through them. This will require something called a “de-compartmentalization” of Water Conservation Areas 3A and 3B. It means that some levees and canals that have separated sections of the Everglades since the 1960’s will be removed and back filled to allow for a more natural water flow into Shark River slough. A “de-compartmentalization” model of WCA 3A and 3B showing a more natural water flow into Shark River slough under future elevated sections of the Tamiami Trail. All of this plays a big part in the comprehensive Everglades Restoration Plan that is unfolding right now. The Plan sees the Everglades ecosystem (sometimes called the Kissimmee -Okeechobee-Everglades : K-O-E system) as a whole, and the goal of the restoration efforts is to hopefully create a new sort of harmony – albeit a human managed “harmony”. The fact is that Everglades won’t ever again be as before one hundred years ago. But with careful science-based research, planning and management, we should be able to get close to a functioning ecosystem again! 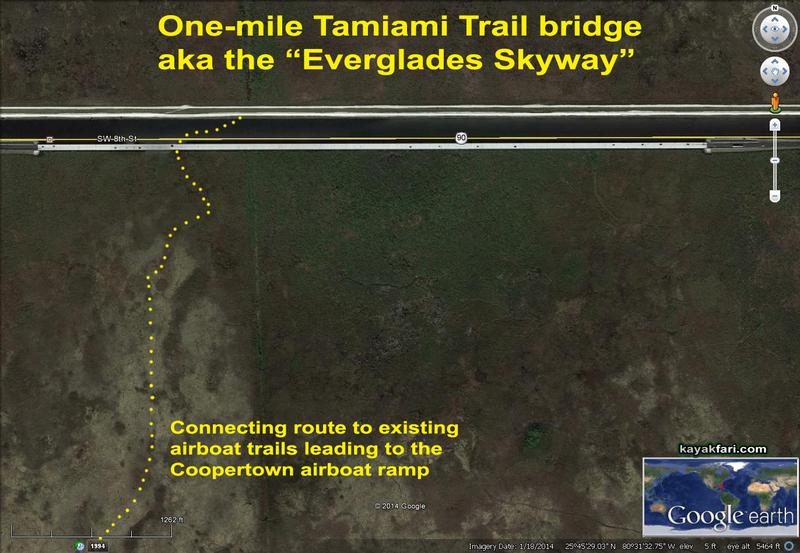 The One-mile Tamiami Trail bridge lead-up in the East Everglades: 1994 – 2014. Note the many now mostly overgrown airboat trails. On a spring day, I decided to check out the bridge and paddle around a bit. This very linear space is just a couple of miles west the of Miccosukee Resort & Gaming complex. Basically it is a bridge, a canal and a levee road, all parallel. I launched my kayak off the levee near the west end of the bridge under the watchful gaze of some crows. Looking due east along the levee road paralleling the bridge with the Miccosukee Resort & Gaming complex in the background. Aerial crow’s-eye view looking due west! Beautiful day hanging out with some courting birds! For this little trip I took out “Rosie” – an Ocean Kayak Peekaboo that is perfect for short trips and where zodiac-like stability is needed. I can actually stand on one leg, on one side, and she still won’t flip over. I can easily deploy an 18 foot Pole Aerial Photography rig while standing on top. Now THAT’s stability! “The West” – facing a wall of trees and sawgrass on the south side. Aside from paddling around for a couple of miles under the bridge, it is possible to paddle about 5 mile loop starting and ending at the public airboat ramp at Coopertown. This is not a marked trail at all, but the wider airboat trails are easy to follow as long as you know your general direction. The best place to then “break out” through the trees and sawgrass back into the canal is near the west end of the bridge. Beware that you can encounter small Jon boats in the canal and airboats in the sawgrass! Ideally a 10 foot pole with a red flag should be on your boat to alert airboaters of your location. Alternately, a red flag attached to the end of a paddle can be used to signal this way also. Paddling around the One-mile Tamiami Trail bridge – the “Everglades Skyway”. Aerial view of airboat “breakout” trails on the south side of the bridge. Standing up in the kayak and holding up the camera on a pole results in a view from about 24 feet above the water. In this case that happened to be about the same as height as the drivers on the bridge! Inside a disappearing old airboat trail south of the One-mile bridge. It was nice to be able to stand and see ahead, however a narrower sit in kayak would have moved a lot easier through the sawgrass! Under the “Everglades Skyway” bridge along an exposed section of the original Tamiami Trail. Tamiami Trail under construction circa 1924! Paddling around and ’round under the Everglades Skyway bridge: Peek-a-Boo! CLICK for more fun “Glades GIFs! I hope you’ve enjoyed this little journey “under the bridge”! The One-mile Tamiami Trail bridge is only the beginning of a new chapter in the story of the Everglades! The new One-mile Tamiami Trail bridge is a potent symbol of Everglades restoration efforts. A page has been turned in the story of the Everglades! Pahayokee to Main Street – probing into the Shark River Slough. Kayaking the River of Grass – a Shark River Slough Expedition. A very interesting and thorough report, thank you. And loved the photos, especially; “Pahayokee to Main Street – probing into the Shark River Slough” and “Running down the Taylor Slough!”. Thanks for the education and entertainment. Your photos help give reality to the area.